Sure, he’s only one Grand Prix into the season, he concedes, but it was a big one. A combination of mechanical problems, some bad luck and team instructions thwarted Bottas’ opportunities last season, when Hamilton was so dominant. It didn’t worry Bottas, who did a lot of soul-searching over the winter break and has come back physically and mentally stronger. 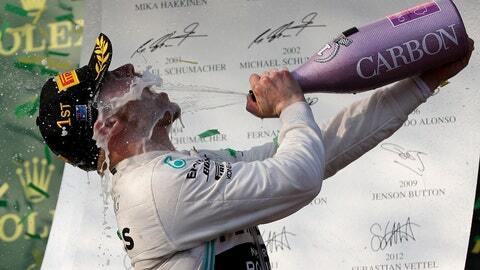 While he’s been great in qualifying in Australia — winning pole position six straight years and eight overall — Hamilton has finished in second place in his last four races at Albert Park since winning the 2015 GP. “A little bit frustrating when you have a good weekend up to then,” the five-time world champion said. Vettel had been aiming to match Michael Schumacher’s record of winning three consecutive Australian GP titles but, despite finishing fourth, wasn’t even close to a podium after starting from third on the grid. Ferrari was expected to have the fastest cars at Albert Park, based on winter testing, but Vettel finished 57 seconds behing Bottas’ leading Mercedes and 35 seconds behind Red Bull driver Max Verstappen, who audaciously overtook him on the outside on lap 31 of 58. Charles Leclerc was fifth in his first F1 for Ferrari. “To pass a Ferrari, to be racing wheel-to-wheel on the straight with them is really positive,” he said. Whiting died suddenly from a pulmonary embolism in Melbourne on the eve of the season-opener, and his presence and influence will be widely missed as the sport’s international governing body tries to find a permanent replacement.